Our village greens were sacred until it was discovered that high bacterial counts were entering our near-shore waters via their drainage systems. 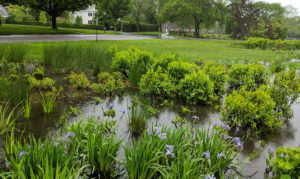 By transforming those drainage systems into life-giving, beautifully constructed wetlands, they can now filter contaminants before the water enters our precious ponds and bays. Learn about the highly successful bioswale at the Town Pond and exciting new plans for one at the Methodist Green. Colleen Henn | Colleen is Surfrider Foundation’s Clean Water Programs Coordinator. She provides support for the 50+ Blue Water Task Force labs across North America, assisting with the growth of new and existing labs, coordinating logistics and communicating critical water quality data to the public. She also coordinates the local Eastern LI Surfrider Chapter. Stephen Mahoney | A member-at-large of Eastern LI Surfrider Foundation’s Board, Stephen is the founder, owner and operator of Mahoney Farm, a wholesale grower of nursery stock in East Hampton. Mahoney Farm is a local wind power pioneer, utilizing best management practices for sustainable farming. Tony Piazza | After formal design education at Cornell University, Tony became a horticulturist and formed the Southampton-based Piazza Horticultural Group in 1998. He serves on the Longhouse Garden committee and the Parrish Art Museum Landscape Committee, and is the designer of the award-winning East Hampton Village green Bioswale project.